The New Moon is Friday December 11. The crescent Moon is close to Mercury on the 13th. Jupiter, Venus and Mars form a line in the morning sky. 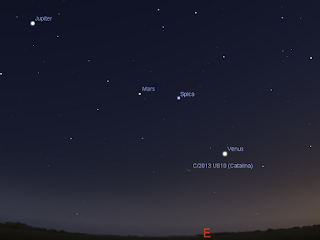 Venus is close to comet C/2013 US10 Catalina. Geminid meteor shower on the morning of the 15th. The New Moon is Friday December 11. Evening sky on Sunday December 13 looking east as seen from Adelaide at 20:45 ACDST. 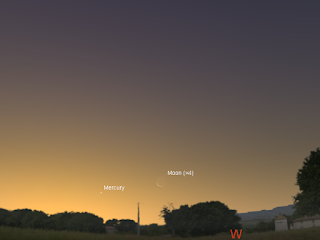 Mercury and the crescent Moon are just above the horizon in twilight. Similar views will be seen elsewhere in Australia at the equivalent local time. (click to embiggen). Mercury returns low in the twilight. The evening sky is now graced briefly by Mercury (well the twilight actually this week). Jupiter enters the evening sky in later December. But while the evening is devoid of bright planets (aside, breifly, from Mercury), the summer constellations of Taurus (with the V shaped cluster the Hyades forming the head of Taurus the Bull and the beautiful Pleiades cluster nearby) Orion the Hunter and Canis Major with bright Sirius, the dog star, climbing above the eastern horizon. 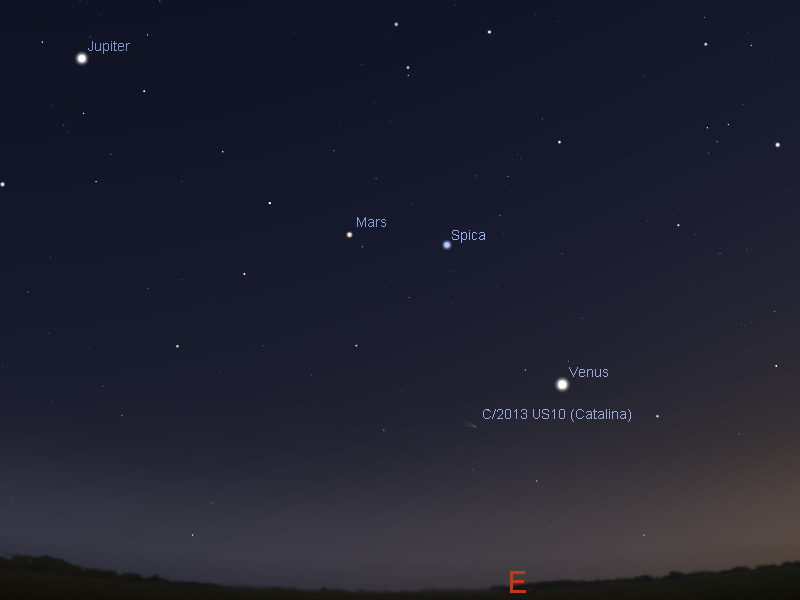 Early morning sky on Saturday December 12 looking east as seen from Adelaide at 5:00 ACDST showing Jupiter, Mars, Venus and comet C/2013 US10. Similar views will be seen elsewhere in Australia at the equivalent local time. (click to embiggen). Jupiter, Mars, Venus and the bright stars Regulus and Spica form a line in the sky this week. The waning Moon joins the line-up making for some very nice morning sights with The Moon visiting Jupiter, Mars and then Venus. Comet C/2013 US10 joins the line-up. It is much fainter than anticipated and at magnitude 6.4 and fading, and being low to the horizon, it is probably a telescope only object. 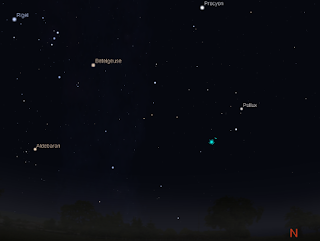 The northern horizon at 4:00 am ACDST as seen from Southern Australia (northern Australia is similar but Gemini and the radiant is higher in the sky) on Tuesday December 15. The Geminid radiant is marked with a starburst . Similar views will be seen elsewhere in Australia at the equivalent local time. (click to embiggen). The Geminids are a fairly reliable meteor shower and this year moonlight will not interfere. The radiant doesn't rise until just before midnight (daylight saving time) in most of Australia, so you will still have to disturb your sleep for this one. Australians should see a meteor every two to three minutes under dark skies in the early morning of the 15th, between 1:00 am and 4:00 am local time. You can find predictions for your local site at the meteor flux estimator (choose 4 Geminids and date 14-15 December, don't forget to change the date to 2015). As well, Orion and the Hyades will be visible and bright Jupiter, Mars and Venus will be nearby. 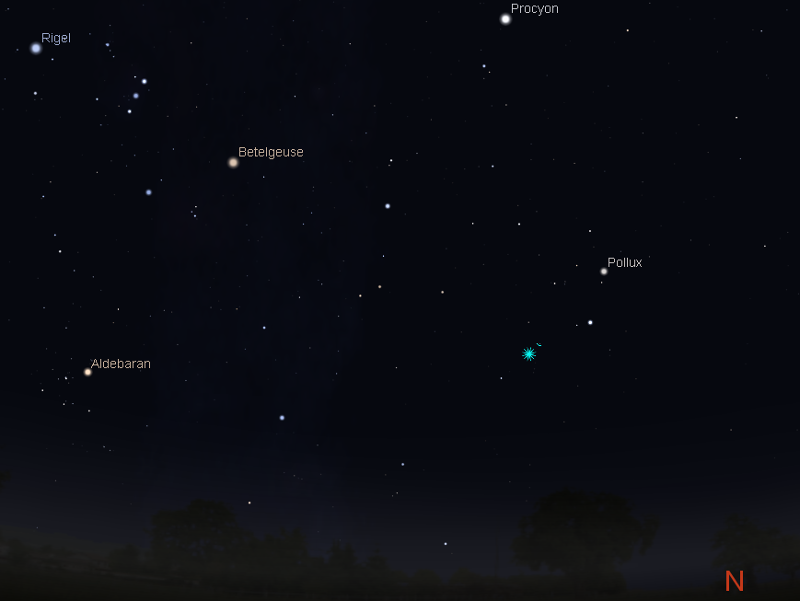 So it will be a quite nice morning for sky watching. Keep an eye out for satellites! If we go 10 handspans left of due North, doesn't that mean we are looking westward, yet Castor has just risen in the East? G'Day You are right (I need to tattoo right and left on my hands)I have fixed it.